Over the last year I've been testing several of Paula Begoun's skin care products from her Paula's Choice brand. Her no-nonsense attitude and lack of flowery marketing prose are always refreshing. The clear information about active ingredients and what exactly they're supposed to do helps in deciding between products and assessing performance. That's not to say that I have sworn off luxury and ultra expensive temptations at the counters, nor that I have an intention to do that (though that's a big part of Paula's mission statement). But I have been alternating between Paula's Choice and various products and brands. I'd say we're all better off for that. 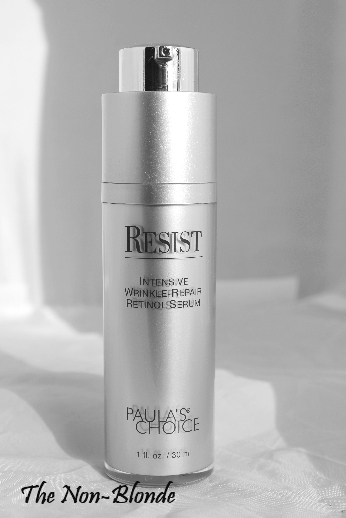 RESIST Intensive Wrinkle-Repair Retinol Serum is among the newer addition's to Paula's Choice's line. I use other RESIST products every now and then, so I was curious about this one that is supposed to offer a higher amount of retinol to provide a higher degree of skin repair. While I don't have any wrinkles yet, I do need some corrective action, and I can definitely tell that the serum does that. I use it at night (the first week I could feel some stinging in the more sensitive areas, so I switched to alternating days) and can see a happier skin in the morning. A nice side effect of the serum is less pillow marks and a bouncier skin texture. I can also see an improvement in visible sun damage. Nothing dramatic, just a nicer, more even skin tone. As of now, I use RESIST Intensive Wrinkle-Repair Retinol Serum for two or three days, then switch back to Clarins Santal oil for a few days. This combination works well for me and the initial sensitivity to the retinol has faded. Paula's Choice serums are silicone-based, so that may or may not be a problem for some. I have no problem with it and I do like that this serum is suitable for use in the eye area. Bottom Line: Like. Really really like. Paula's Choice RESIST Intensive Wrinkle-Repair Retinol Serum ($29.95, currently on sale for $25.46) is available from paulaschoice.com. They also sell sample of the products ($1.25 for 1ml), a practice I'd dearly love to see becoming a standard. Do you use a moisturizer on top of this serum? I use several PC products but have not tried this one.